Buckeye Valley freshman Dylan Thompson (1) drives toward the hoop as Marion Harding’s Mitch Myers (25) defends in Saturday night’s game in Delaware. Thompson scored a game-high 18 to lead the Barons to a 64-23 win in MOAC play. DELAWARE – Buckeye Valley boys basketball coach Andy Gast talked about how much his team’s defense has improved and how well his players are understanding their roles before Saturday night’s game against Marion Harding. It was all on display as the Barons raced out to a 17-4 lead and never looked back in a lopsided 64-23 win over the Presidents in MOAC play — a game that was a far cry from the one-point loss BV suffered at Harding a month ago. 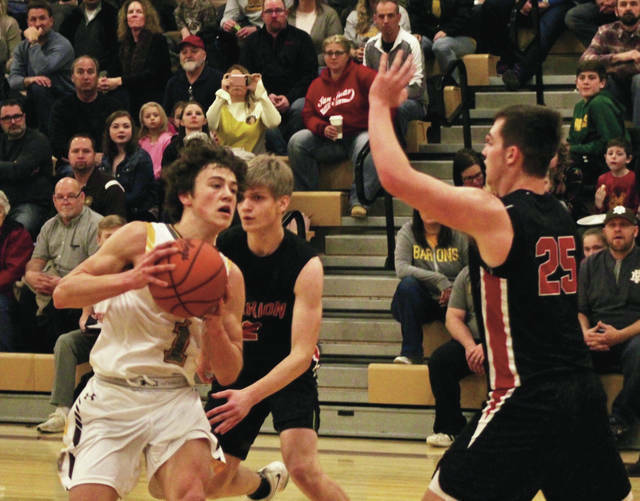 The win is the Barons’ third in their last four games with the lone loss coming in a double-overtime heartbreaker at league-champion Clear Fork Tuesday night. Gast described Thompson as one of the best on-ball defenders he’s coached. But Thompson showed how he can be an offensive threat as well. “Offensively, when he starts putting his game together like he did tonight – he was aggressive taking the ball to the basket, his shot is coming around – that’s just a whole other level for us,” Gast said. He knocked down a 3-pointer to open the game and scored the other three baskets in that opening sequence in the paint. Defensively, the Barons have shed their full-court press in favor of a half-court man-to-man. “I think that’s been our big turnaround the second half of the season,” Gast said. The Barons (8-8, 5-6) won the first two quarters by identical 17-6 scores and topped it defensively by allowing just 11 points in the second half. Harding made just nine field goals overall with one coming outside the paint – a Garey Moaney 3-pointer that turned out to be the only President points in the final frame. BV finished with 11 steals and five blocks on the defensive end led by Owen Osbourne with three steals and Troy Scowden with three blocks and a couple of steals. Scowden added six rebounds and three assists to go with four points. Dylan Herbert had 11 points, eight assists and five rebounds, Jack Rotondo also finished with 11 points and Max Stokey added 10 points and eight rebounds to back Thompson’s effort for the Barons. Moaney finished with seven points and five boards to lead the Presidents (5-11, 5-6). Next up, BV hosts Worthington Christian Tuesday night at 7:30 p.m. in a non-league game that Gast thinks will have tournament-seeding implications.